Increases energy levels, motivation & drive - perfect for those days you feel flat! This is a relatively short 30 minute energy boost hypnosis session designed to be used during the day for a quick and easy 'pick me up'. It will realign your energy levels and to give you the much needed boost, especially after lunch if you are at work, to keep going strong for the rest of the day. This specifically designed hypnosis session contains a powerful recorded rapid induction to get you into the deeply relaxed states of Alpha and then Theta very quickly. It then uses direct suggestions and visualization techniques to align your mind and body to unite in part to boost your ensuing energy level. 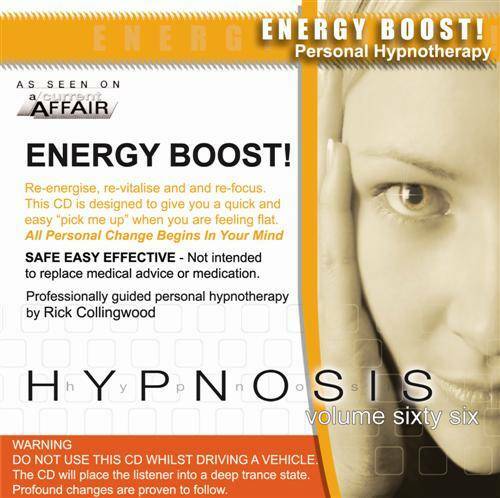 Just before this recording ends there is a hypnotic 'wake up' which like on all the other CDs, will bring you back to your full conscious attentive state and ready to tackle what the rest of the day has to bring. A special component of Energy Boost is the 'post hypnotic' suggestion contained on the recording which allows you at anytime to immediately increase your energy levels if you are feeling flat or tired simply by clenching your fist. This is a very strong technique that will help you especially on those extra busy days when you have to simply keep going to get everything that you need done. I heard you speak in The Aware Show and I would like to thank you very much for that enlightening talk. I really learned a lot from you. May you continue to help more people. More power.